Why do the watertowers in Finland all look the same? Most of them look like a giant mushroom. I'd like to have some cool ones like you Dutch/German/Belgian people do.. Built in 1968. There's a restaurant at the top. Last edited by grob-e on Mon Aug 07, 2006 8:29 pm, edited 1 time in total. Marshalling yard or railroad shunting yard, says the friendly lion. This one is in Kreuzberg, north of Tempelhof airport. It looks like it has a minaret, no wonder in Kreuzberg. The tower of the water in madrid are underground deposits with (I think) one of the best waters in the world. The water for the 5 million of people in the comunity of Madrid is served by the "Canal de Isabel II". It can hold up 945 000 millions of liters in reservoirs and dams, now it´s at 49.2 % (464,982 Hm³). In the 2003, it treated 607,47 Hm³ of drinking water. And purified 257,3 Hm³ in the 2000. Donald wrote: In the thread about # of eurotrackers in your city many users showed pictures of water-towers in their cities. I just begin this thread especially dedicated to water-towers. Please show us your local water-tower, maybe you can add some information about it. 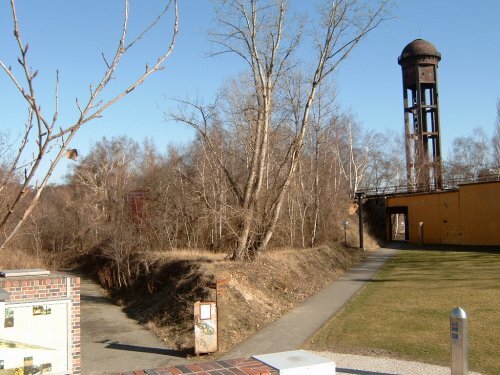 This is the water-tower of Geilenkirchen. I could not find much information about it. They put lots of mobile phone transmitters onto it. That´s the watertower of my hometown. I grew up som blocks away. Our watertower has been renovated recently. I'd like to contribute a photo of this watertower in Vlaardingen. It may not be the most beautiful one. But it is the one we'd like to buy for our foundation. So for me it is more worth than all the bills from Eurobilltracker.